pictures from google, weheartit, tumblr and more. none are mine. The last couple of days I've been looking up a lot of pictures of makeup looks featuring dark lipstick. This can either be black lipstick or a nice deep wine red, purple, or any other colour of the rainbow. I'm really liking this edgy somewhat goth colour for lips. I picked up a really pretty wine red yesterday, it's called 'After Work Wine' and it's from Catrice. It was only €3,99! Below are a few pictures of dark lipsticks I wish I owned. 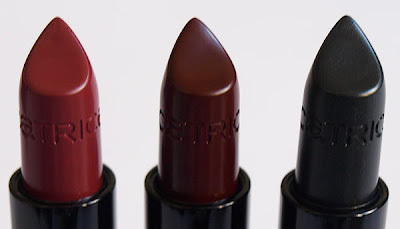 Catrice dark lipsticks. Totally cheap and gorgeous pigmentation. I own the middle one. 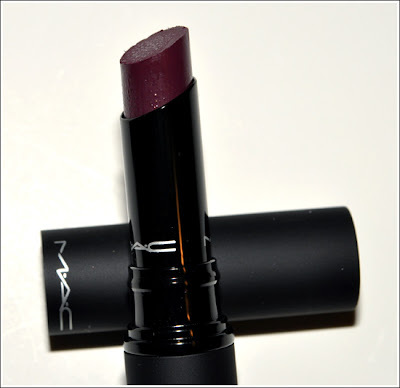 MAC Mattene Night Violet. Sadly discontinued. MAC is coming out with new mattene lipsticks in October. This picture belong to Christine at Temptalia.com and was taken from this article. i want the black one! !